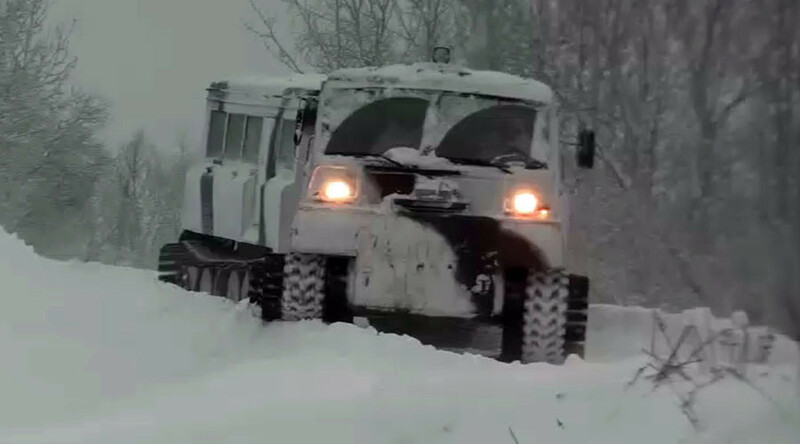 The Arctic brigade of the Russian Northern Fleet has field-tested new specialized tracked vehicles that can carry troops across treacherous terrain like snow and swamp and cross water. The ATV called Ruslan has two segments connected by a special powered joint. The joint can be used to make sharp turns and raise one of the sections, allowing it to climb a barrier of up to 1.8 meters high or enhance the tracks' grip by redistributing the pressure. The vehicle is also amphibious, crossing water at 5kph compared to its regular 48kph on land. The vehicle can carry up to 16 people, including the driver, and can operate at extremely low temperatures down to -50 degrees Celsius. The back unit may be replaced with a medical bay or sleeping quarters. The military version was fitted with light armor plating to protect the crew and the passengers.